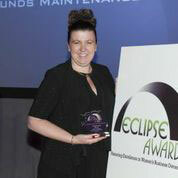 Affiliated Grounds Maintenance Group, Lake City, PA, has been honored with one of three 2014 NWBOC Eclipse Triumph Awards, according to Janet Harris-Lange, President, National Women Business Owners Corporation (NWBOC), a national WBE certifying organization. Crystal Arlington, President, received the award which recognizes woman business owners for outstanding leadership, ingenuity, and perseverance in successfully navigating a challenge, barrier or obstacle affecting her company. The 2014 NWBOC Eclipse Awards honorees were announced Thursday evening, May 8, 2014, at the organization's Decades of Excellence II awards gala at PGA National Resort and Spa, Palm Beach Gardens, Florida. During the evening's ceremonies, Eclipse awards were presented to a diverse group of women entrepreneurs selected by an esteemed panel of judges. NWBOC created the Eclipse award program to recognize, reward and celebrate the exceptional achievements of certified women business owners, according to Harris-Lange. Affiliated Grounds Maintenance Group, Inc., headquartered in Lake City, PA, has grown to encompass work in 39 states with over 4700 Affiliated Partner Contractors. The company provides exterior maintenance services including landscape maintenance, snow and ice management, lot sweeping and power washing to some of the country's largest companies and property management firms. As a national exterior maintenance service company we offer property managers, maintenance engineers, and facility owners a regional experience with certified professionals. Snow and ice management is a key exterior service for many facility owners in the United States and Canada and since Mother Nature is often unpredictable, it is also a highly risky service both in terms of safety and fiscal responsibility. AGMG provides professional snow and ice management exterior services through our approved affiliate partners with over 20 years of experience and includes SIMA Certified Snow Professionals. Our management team possesses hands-on experience in snow and ice management and is highly trained in the latest technology for safe snow and ice management practices. As a provider of landscaping services, we oversee the successful implementation of your facility's landscape services within budgetary requirements to ensure your property receives the best care and results. Founded in 1995, National Women Business Owners Corporation (NWBOC) leads the way as the nation's first national WBE certifiers. The goal of NWBOC is to increase competition for corporate and government contracts through implementation of a national certification program for women business owners. NWBOC is located at 1001 W. Jasmine Drive, #G, Lake Park, Florida 33403. The web address is www.NWBOC.org. For more information about NWBOC or the Eclipse Award Program, contact Janet Harris-Lange, President, (800) 675-5066 or janet@nwboc.org. Richard Arlington, CFO of Affiliated Grounds Maintenance Group, will be one of the panel members for a seminar at the 2015 National Pavement Exposition entitled "How to Get the Most Out of Your Relationship with Third-party Providers." The seminar is sponsored by the World Sweeping Association, will include another third party provider representative and two sweeping contractors, and will be moderated by WSA's Executive Director, Ranger Kidwell-Ross. For more information on Affiliated Grounds Maintenance Group, Inc., visit www.agmgus.com or call (866) 923-AGMG.